The criteria for rankings differ a bit from list to list, as do the findings. No matter which list you choose, though, you won’t hear us arguing that the top universities are not wonderful places to learn. These storied institutions offer prestige and connections that can carry students far—and a quality education to boot. But do these top-ranked universities necessarily provide a better education or experience than their lower-ranked peers? We would argue that a ranking simply can not make that kind of nuanced judgement, though your applicants do anyway. Some rankings have been dogged by rumors of dishonest dealings—where the organization doing the ranking has an interest in seeing their paying clients do better. Makes us squirm just to write that, but there it is. You've heard about these underhanded approaches too, no doubt. But even if we assume that all rankings listed are truly trying to be fair and impartial, the very nature of these rankings is fundamentally flawed. How do you truly rank the experience a student will have at one university, compared to the experience he or she might have at thousands of other options? True student experience is about quality of classroom teaching (impossible to quantify in part because the unions won't let you), happiness on campus (also a difficult objective measure), and satisfaction with the skills and connections gained (this one too). Students can find all of these things just as easily at a “no-name” university as at an Ivy or other global leader. To complicate things further, different cultures tend to look at the same situation with different levels of cynicism (glass half empty, anyone?). According to some studies, the typical person on the street in Malaysia has a happiness/life satisfaction quotient far higher than his or her counterpart in India. And of course, students have different needs! One student’s “best” is not another’s. A simple scroll through Yelp! reviews for just about anything can be quite confusing. If rankings can’t account for uncountable intangibles, what do they account for? Again, the details vary from list to list, but in general, what they’re actually ranking is…. A high number of applications and a low number of acceptances works in a university’s favor. This means that the more applications a university can draw, the better their ranking will be…and the more applications they will draw the next year, and the next. It’s a never-ending cycle. Number of citations for faculty publications: This metric favors science-oriented universities, particularly those with a medical school, as scientific fields have higher publication rates. It also favors publications where faculty publish in English, as citation databases often miss non-English publications in their counts. And then there are the flood of research publications coming out of China that are primarily pay to play money making ventures with little or no peer review. So, when you count these citations and it improves your rank...you see the problem. It does not necessarily favor students. Research and teaching are two different things, and a great researcher does not a great teacher make. Nor does a hard press to publish as many papers as possible encourage faculty to direct their attention to the classroom, so a big focus on research often means a heavier reliance on adjuncts and TAs. Reputation: Some lists, such as Times Higher Ed and QS, include this amorphous factor in their rankings. “Reputation” is based in no small part on previous rankings and wealthy alumni—making it easier for top-ranked schools to stay forever at the top of the pecking order. Money: Money brings in more money. Many lists take into account the amount of outside money flowing into the university, including research dollars and alumni donations. Research funders and government initiatives intended to promote educational excellence often direct money to top performers (i.e., top ranked universities). This means that budgetary gaps between the schools at the top of the lists and those at the bottom only continue to grow. Alumni of top schools tend to come from money (see below) and make more money post-graduation. This means that prestigious schools are more likely to receive big alumni bucks—and stay perched at the top of the rankings. While many top universities make efforts to diversify the socio-economic mix of their student body, there is no doubt that the children of the wealthy are more likely than not to end up at a top-ranked university—and to send their children to a top-ranked university in turn. Top-rated schools attract and accept students from prestigious high schools and families. These alumni often go on to big-salary positions, adding to their alma mater’s endowment and prestige and maintaining that high rank. The caveat: we are talking trends here, as opposed to the rule. Of course, hard-working students can achieve the same status. But we all know the averages favor those with pre-existing status. Here's the thing about what makes a great learning environment: smart students from less privileged backgrounds may make huge personal gains at the right, nurturing educational environment regardless of school rank. What if we had a method of truly evaluating the rate by which an academic institution moves a low or mid-tier student to a highly trained professional and satisfied person? Call it a Personal Progress Quotient. By this measure, a student coming in with a rating of 5 and leaving at that same level would not really move the needle. But a student coming in with a rating of 1 and graduating as a 4 would indicate the institution had excelled. Successful graduates may go on to be a great high school teacher in their community, or an accomplished artist, or a reporter for the regional paper, or a fantastic parent. Their names might not end up on a building at their alma mater, and they may never bring home the money that the alum with pre-existing status might. But that doesn’t mean that their university experience didn’t nurture and benefit them in ways that are meaningful and real. And their personal success would certainly indicate that the institution had done its job well. We often hear from lower-ranked schools who despair that they don’t stand a chance at appealing to domestic or global students. Is it easier for a big-name school to attract students? For all the reasons discussed above, the answer is, of course, ‘yes.’ But this does not mean that lower-ranked universities can’t succeed. There are enticing qualities that make your institution stand out as best fit for the right type of students. You need to identify your differentiators and segment your audience. This advance work will focus your marketing spend to the targeted audiences that will find your institution attractive. Sounds so simple, right? It's not. You don’t need to reach everyone. Target your efforts wisely to spend wisely. You’re going to need to work smarter in order to capture the attention of students and families—but it’s still possible. Partner with quality service providers and agents who can help prospective students learn about all you have to offer. Choose a smart marketing partner (ahem, cough) to help you develop messages and launch targeted campaigns that make an impact. 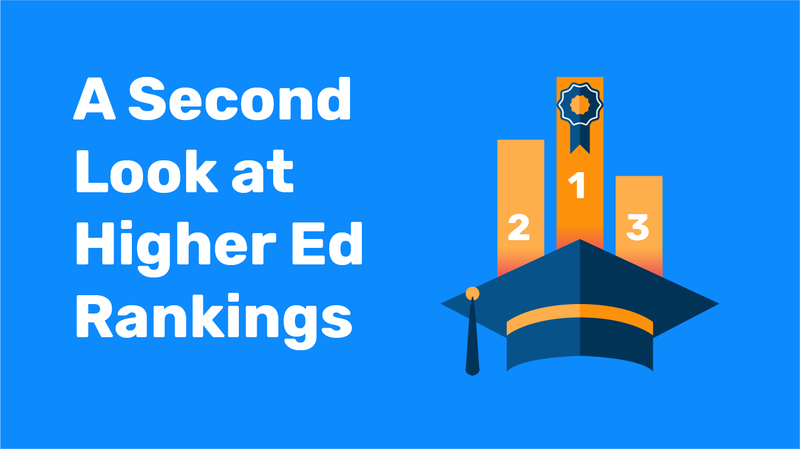 Rankings matter a lot, and the reality is that they’re not going anywhere. But a university is a collection of people, not a number on a page or a screen. While rankings offer the allure of orderly precision, crafting a quality education is as much art as science. There are actually many "right" schools for every student—and yours is among them.